Operators completing longer laterals in the Montney have achieved great success completing wells using the StackFRAC® HD-X system. One early adopter’s wells outperformed nearby wells by at least 37% after 12 months of production. StackFRAC HD-X was designed to allow for higher stage counts to achieve a more effective, high density treatment. As laterals are drilled longer and longer, operators want a system that can deliver higher stage counts and tighter spacing for a more effective stimulation that will result in better production. An operator was looking for a solution that would strike a balance between increasing stage count while maximizing operational efficiency. With the ability to increase stage counts and stimulate wells with minimal non-productive time, the operator used StackFRAC HD-X systems for nearly all their completions in the Montney throughout 2017. StackFRAC HD-X is the next generation of ball-activated systems, exceeding the industry standard of 1/16-in. to offer operators even tighter increments and higher stage counts. The higher stage counts offered using StackFRAC HD-X allow operators to improve production while maximizing operational efficiency. In the township with the highest concentration of the operator’s wells in early 2017, the top 4 highest producing wells were completed using StackFRAC HD-X. In this 9.7 km2 (6 mi2) area, a comparison of production after 12 months shows that the average StackFRAC HD-X well production was at least 37% higher than wells completed using other technology. Within the first year of its release, several operators have had success using StackFRAC HD-X. The system has been run by over 25 operators in more than 10 formations, adding up to over 4,000 stages in Canada. Packers Plus is the innovator of multi-stage completion systems, providing field-proven and cost-effective solutions through a range of applications worldwide. For more information about StackFRAC HD-X or other solutions, go to packersplus.com. 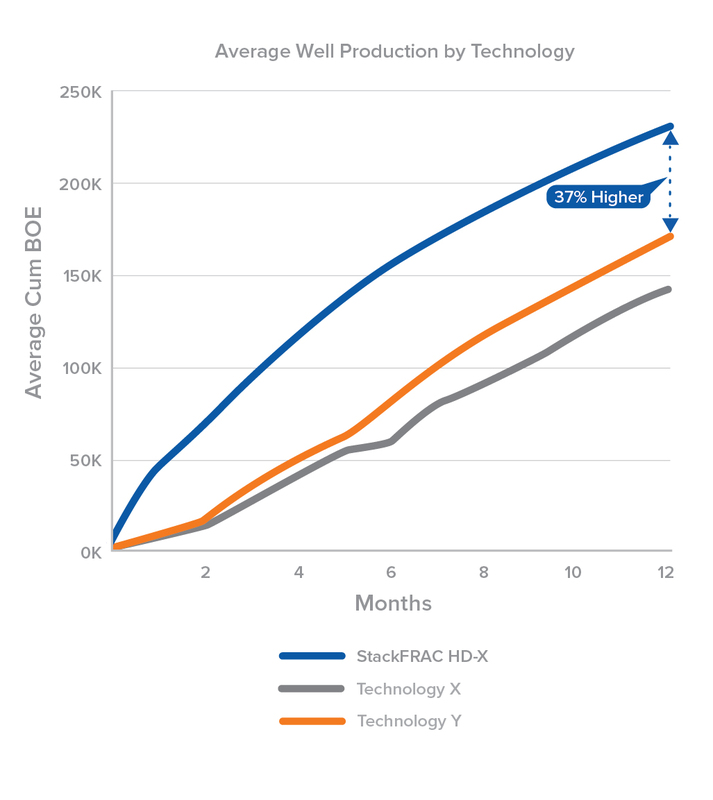 After 12 months of production, wells completed using StackFRAC HD-X were at least 37% higher than wells completed using other technology. 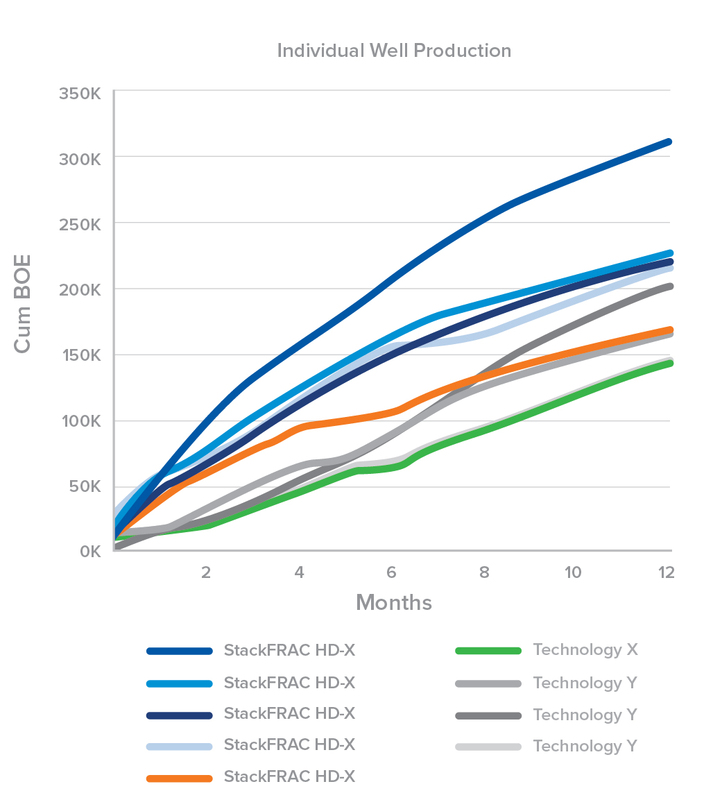 12-month cumulative production of wells completed by StackFRAC HD-X and other technologies.